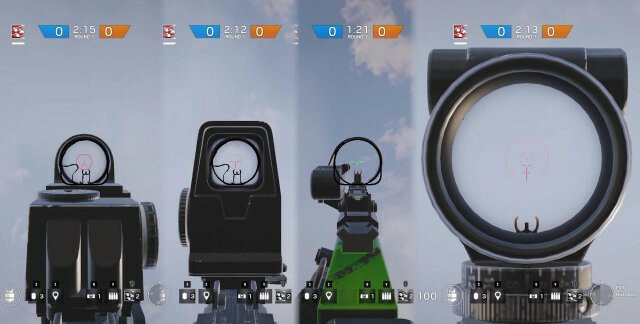 Rainbow Six Siege Guide: What are the Best Scopes? This guide will compare all the available scopes that you can use on your weapons when playing six siege. I compared the general area of sight on each scope (except the acog scopes) to give you a better view of what sights give you more view than others. Note, don't just take my word on what scopes to use since situations can vary plus it's your preference on what you should use and be comfortable aiming with. Which scope is the best in my opinion? Holographic- It's the best scope to chose if you can't chose a ACOG scope from Scopes #1. From Scopes #2 you can see that it provides a little more view area inside the scope but the red dot scope provides much more view area outside of the scope which is better considering how much space the Holographic scope on Scopes #2 takes up. Red Dot - From Scopes #1, it provides more view area than the Reflex Sight inside of the scope. From Scopes #2, it has only a little less view area than the holographic scope but has more view area outside of the scope which is beneficial. Reflex Sight - I despise using reflex sights but many people love using them. Again it's your preference what you chose. For me, the triangle from Scopes #1 is uncomfortable to use. The reflex sight on Scopes #2 completely doesn't work for me since it doesn't give you enough zoom and makes it even more difficult to aim although this is the scope that gives the most view area outside of the scope. Want to get some cheap R6 Credits? Just check Games Gold for more deals on Rainbow Six Siege now. Previous: How to Get UFO Tattoos in GTAOL?